It happens every year. 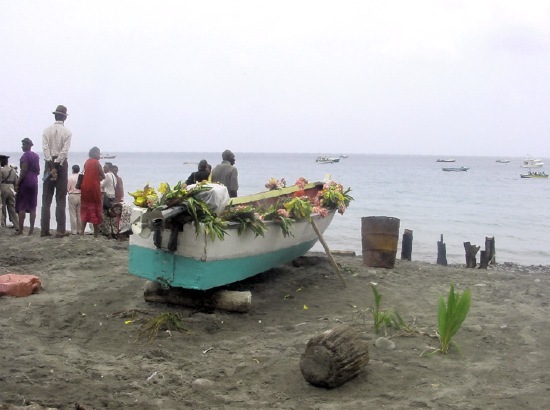 On the 29th June, Grenada's west coast town of Gouyave stops, prays, walks in procession and blesses the fishing boats. It is the ceremony of the blessing of the fleet.. This old tradition has been honoured for as long as the people can remember. 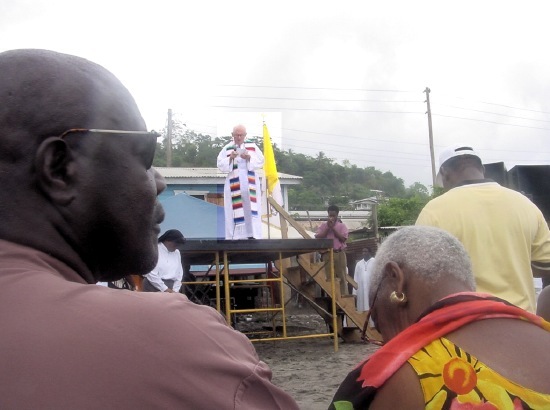 The blessing of the fleet links Gouyave to local fishing fleets, and to fishing fleets in the Westindies and beyond. It is the feast of St. Peter, patron saint of fishermen all over the Christian world. This tradition is rooted in the dangers of going to sea, and as seventy-year old Gouyave fisherman, Marny Telesford, remembers, "it was very dangerous and many more fishermen were lost." Marny was fourteen-years-old when he set out to learn the trade. He sailed in small sailing boats as an apprentice. He learned how to fish and where to find the fish and the returns were very small. 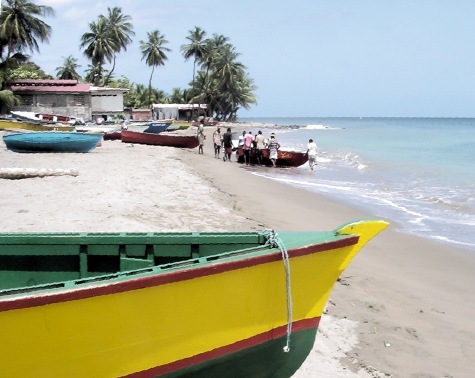 The Gouyave fishermen who go down to the sea each day are linked by profession to St. Peter. The difficult life, the long day away from land, living with and in Nature. The battling with wind and wave. The late return to the tame shore and the land lubbers, who will never be able to tell stories about the ones that got away. "All is changed now by technology," says Marny, "Fishing is still a dangerous occupation but the motor engine, refrigeration and the radio linking boat-to-boat and boat-to-shore have radically changed the life of fishermen." 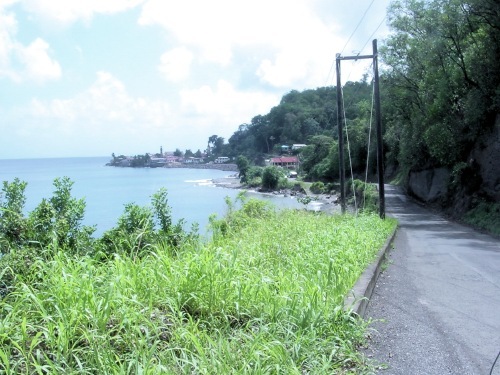 For a never-to- be forgotten treat, travel from St. Georges up the Western Coast Road towards Gouyave This is a wonderful journey. You will experience a winding scenic road suspended between the Caribbean Sea and the lush mountains. Your drive will take you through many small villages with exotic French and Creole names --- Grand Mal, Fontenoy, Molinere, Mt. Moritz, Beausejour, (French for "a lovely stay" --- where you'll see a genuine Plantation House on the hillside that is still occupied.) The flat land in this location was the scene of heavy fighting in 1983 between US forces and Cubans. Further along, you can't miss Halifax Harbour which is the only anchorage on this coast between St. Georges and Sauters. Below is a Sugar Mill out of sight. Along the coast are overgrown Forts. They were used to protect the coastline and to oversee the safe loading of the sugar onto boats for Europe. On through Cote Melee and Concord with the Falls to the right. A lovely stone bridge takes you to Grand Roi. Then continue to Palmiste where the sea meets the road and finally Gouyave, dominated by the magnificent steeple of the Roman Catholic Church seen in the distance. Stop the car at the top of the hill at Mobaya. There is a large quarry on the right. Before it was cut away, it presented a hazard for travellers as it slid onto the road in heavy rains causing fatal accidents. Solutions to deal with this problem included asking a British Destroyer to blast the whole hill. The Carib word, Mobaya, meaning Evil Spirit, was well chosen.! Gouvaye, built by the French in the 18thCentury, is a long winding town cut in two by the Gouyave River. The part before the bridge was known as Charlottestown. Over the bridge was Duncanstown, now called L'Anse, meaning Beach. This will give the visitor a clue to the secret of enjoying Gouyave. The Story of Gouyave---Gouyave's History---has three levels. The French town with its two Forts --- one was on the site of the present Nutmeg Factory and a second Fort on the Hill near the convent. On close inspection some old walls of this first town may be found. The second level is the town built during the period of the English Planters. Lovely old iron work may be seen in gates and railings. Stop at the beautiful house in centre Depardieu Street next to the Post Office and admire the railings, gates and fountains in the front garden. The Library, which is entered from the Sea side, has a handmade balustrade of iron. Tiled steps from England lead upstairs to an airy house with fretwork ensuring coolness.while reading Look up at the Georgian wrought iron balcony of the Post Office. Visit the Anglican Church at the top of St. Peters Street. Here Mr. Hay is buried, one of the three prisoners released by Fedon, the mulatto planter who lead a revolt against the British in1795. When British Governor Ninian Home was captured at Gouyave by Fedon, he was taken to Belvidere Estate, high in the mountains above Gouyave. He, along with forty-eight followers were put to death. The ensuing revenge by the British when they surrounded and killed the rebels put paid to the uprising. But they did not get Fedon who disappeared and has not been seen to this day! The Brass Cupola on the first Catholic Church in Gouyave is the only one in the Caribbean. Look through the open windows for a surprise. The floors are covered from wall to wall with glistening brown nutmegs. They are turned regularly to dry by two charming young ladies.! Look carefully at lovely brick houses peering beneath coats of paint. All this is old Gouyave peeping through the third level of modern concrete houses and shops. As you go through the town, glance to the left through the gaps between houses to the beach, the sea, the fishing boats. For this is the heart of Gouyave "the town that never sleeps." Fishing gives the town its money, its employment and its character. The dependancy of fishermen on each other against the hazardous sea ensures that "no matter what harsh words are said on one day, apologies follow afterwards." 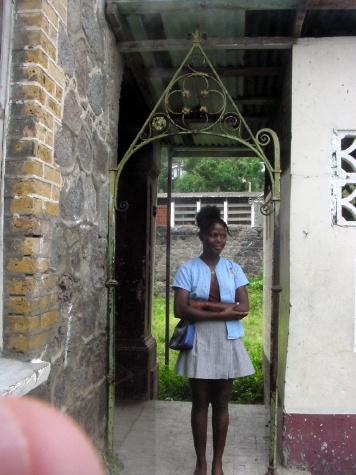 There is a lovely feeling of community and friendliness in Gouyave --- people who live close to and respect nature. 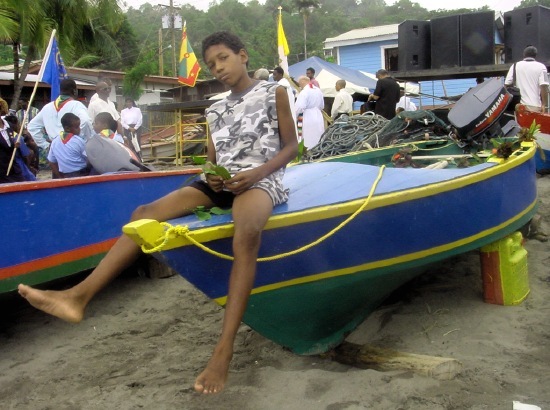 Fisherman's Birthday commemorates the life of Gouyave each year. The Ceremony in St.Peter's Church includes a moment's solemn silence for colleagues taken by the sea. 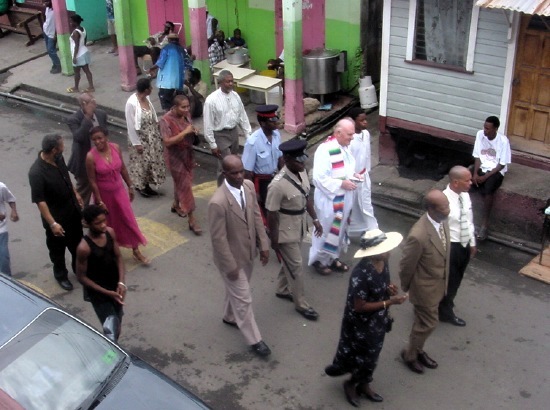 Trumpets are played, songs are sung and the procession is headed by the Governor-General, Sir Daniel Williams and Lady Gloria, with the Parish Priest, Government Ministers, Scouts and Guides accompanied by bands, proceed through the town followed by the fishermen and people to the beach at the L'anse. 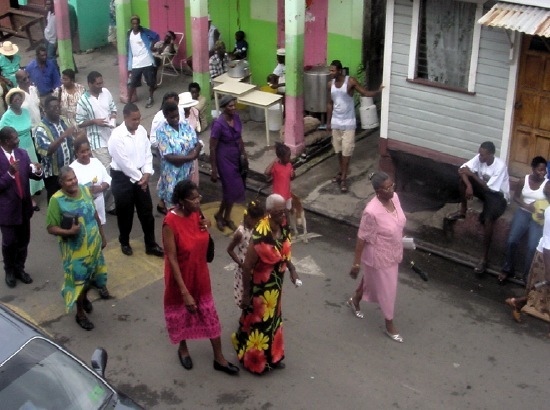 People process through Gouyave to beach on St. Peters feastday. Here the boats of all shapes, sizes and colours are drawn up. Sailing boats, wooden boats- locally built, fibreglass boats with exotic pictures on them, boats decked with flowers. All are blessed. Petitions are made to keep the boats safe and all who work them. Thanks is given to the bountiful sea and its spectacular crop. An exhibition of all the fish caught in these waters is attended by everybody. The variety, the colour and the sheer beauty of the fish laid on ice for all to see, is marvellous. Models of the boats used and the statistics of crew, cost, and size make this an informative and memorable visit. There are plenty of activities during the evenings leading up to and on the 29th July for the more adventurous. Steel bands, gospel concert, and "jump up" are all available. The programme of events is widely advertised. Tasty fried fish and chicken, corn and beer are sold along the streets. Some good local restaurants are open "whenever food is needed!" Drive home by taking the mountainous Fraje road to Grenville and smell the cloves, the cinnamon, the nutmegs and cocoa.. That will be a perfect ending to an unforgettable outing.